The Department of Education has provided some guidance for students displaced by sudden college closures, but a large gap in financial aid knowledge remains for this population. In its new paper, "Designing Regulations to Protect Federal Student Loan Borrowers: Closed School Discharge," NASFAA examines existing and proposed provisions for closed school discharge from the perspectives of equity and efficiency, and provides seven recommendations that underscore the importance of policies that balance the interests of students, institutions, and taxpayers in the event of school closings. NASFAA retained McKinley Advisors to conduct research on college presidents’ perceptions of their financial aid offices, administrators, and the profession at large. Overall results showed college presidents were satisfied with their financial aid administrator's ability to perform their job functions and were interested in receiving additional information on how to improve the relationship between and the function of their financial aid departments. Our report "Findings from NASFAA’s Research on College Presidents" further details the findings from this study, as well as recommendations for next steps. 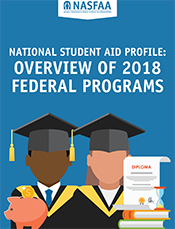 Beginning in fall 2014, a working group from NASFAA and the Association for the Study of Higher Education (ASHE) embarked on a yearlong effort to identify and examine ways to make financial aid research more relevant to financial aid practitioners. Research Meets Practice: Findings From a Collaboration Between NASFAA and the Association for the Study of Higher Education presents the findings from this work along with recommendations for how research can better inform the practice of financial aid administration. In addition to our recommendations, this study identified three main themes as a result of the feedback from, and conversations with, financial aid administrators.